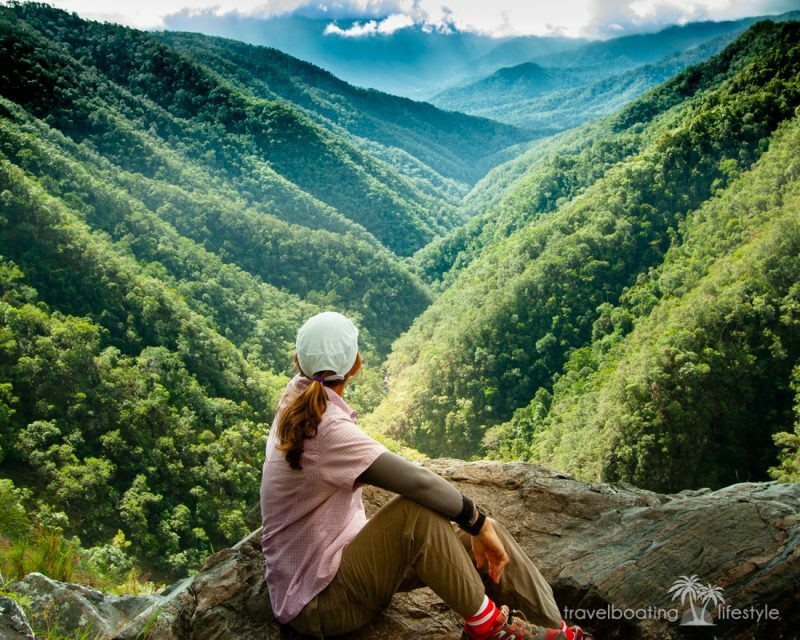 Windin Waterfall on north Queensland’s Atherton Tablelands is the stunning reward for a relatively easy 90min hike through rainforest of the Wooroonooran National Park. Trailhead starts near Malanda. After hiking for almost two hours, still not certain we’re on the right trail, the increasingly loud burble of water confirms we took the correct trail at the orange tape-marked tree 20 minutes earlier. 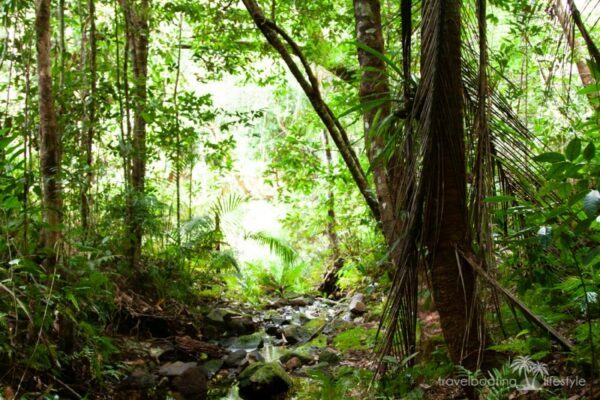 Descending down a steep embankment pocked with tree roots and rocks, the rainforest closes in above a trickling stream sprouting with giant tree ferns. 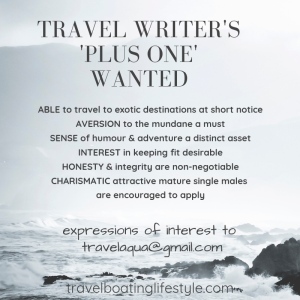 Rock-hopping across gin-clear water filtered through the world’s oldest Wet Tropics rainforest, we emerge into the dazzling glare of sunshine. We’ve arrived spectacularly at the top of Windin Falls. Windin Falls from Fiona Harper on Vimeo. 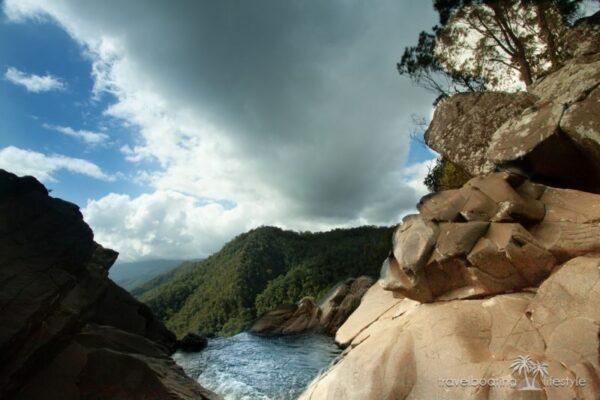 Find more Atherton Tablelands Waterfalls here! ‘Wow,’ is all I can think of to say. Then I say it again as we edge closer to the precipice. The view is so extraordinary it takes my breath away. I’m so excited, it feels like we’ve summited Everest. Instead of snow-capped peaks of the Himalaya’s, rich forest-clad peaks line up cheek by jowl, jostling for position like young boys on a football team. Down the Mulgrave Valley and far in the distance the summit of Mt Bellenden Kerr is concealed behind a line of cloud. Water plummets to unfathomable depths below from the pool at my feet. A bird of prey circles overhead, gracefully gliding the updrafts above the watery tumult. I desperately want to swim in the pool, but the water is freezing! Instead, I take a gazillion photos, vowing to return later in the year when the sun is warmer. Next time we’ll bring a picnic lunch (ill prepared for this impromptu hike, all I’ve got in my pack is a can of tuna and a handful of almonds – not quite a picnic!). The Atherton Tablelands is no shrinking violet when it comes to mountain streams cascading over craggy outcrops before plummeting to unfathomable depths below. Oh yes, the highlands west of Cairns are quite the drama queen who all her ‘look at me’ beauty. North of Malanda, drive along Topaz Rd from the Gillies Hwy. Take a left turn down the Old Cairns Track at the Bartle Frere National Park sign. Take time to enjoy the stunning views over rolling hills towards Mt Bellenden Ker from Lamin’s Hill lookout. Veer left at the Gourka Rd intersection and drive for about 4km until you reach the gate which marks the start of the trailhead. Mountain bikers, this is where it gets a bit tricky: lifting your bike over the gate is the first challenge. The OCT is easily navigable for hikers though mountain bikers will be challenged by eroded ruts deep enough to swallow a Landrover. The main trail continues for approx. along a ridge passing through along the ‘road’ that once connected the Tablelands with the Goldsborough Valley. 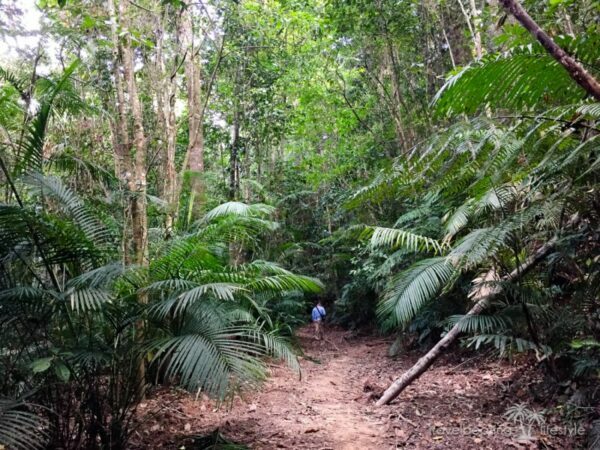 The vegetation varies from lush rainforest with towering lumber to wet sclerophyll forests of casuarina. It is a beautiful hike. About 4km from the gate take a sharp right-hand turn (marked by orange tape at the time the writer visited) onto a steeply descending single track. If you come to a distinct Y junction that drops down to the left and right, you’ve gone too far and missed the turn to Windin Falls. The reward for less than two hours of sweat equity is arriving at the top of Windin Falls. A stream cascades gently into a number of small pools, the highlight of which is a small pool at the very edge of the cliff before the falls plummet unfathomable depths below into the Mulgrave Valley. It is nothing short of spectacular. Cool off in the crisp clear water while taking in the view and thank your lucky stars to be alive. This is the sort of place that will re-calibrate your sense of place in the world. The Windin Falls hike is a ‘moderate difficulty’ hike that anyone of reasonable fitness can do. The steepest section is the single track ascent on the return when leaving the falls. 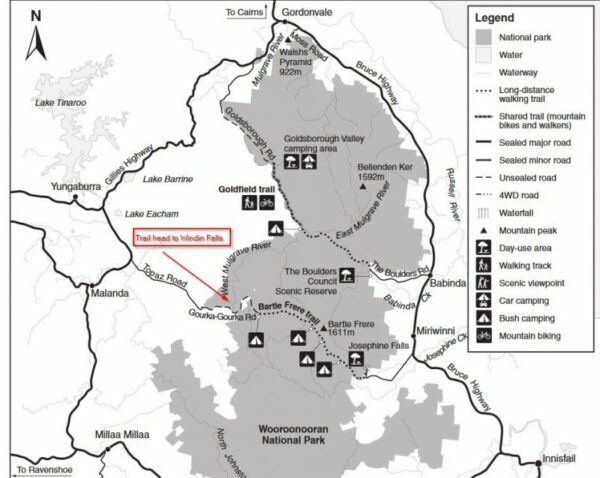 The unpronounceable Wooroonooran National Park (let’s just call it WNP to make it easier for everyone!) is the poster child for hiking trails, waterfalls and wildlife spotting opportunities in the region. King of the mountain, literally, is Mt Bartle Frere, Queensland’s highest peak dominating the landscape with her 1,622m peak mostly concealed in cloud. Sibling Mt Bellendon Ker (1,593m) is almost equally lofty. 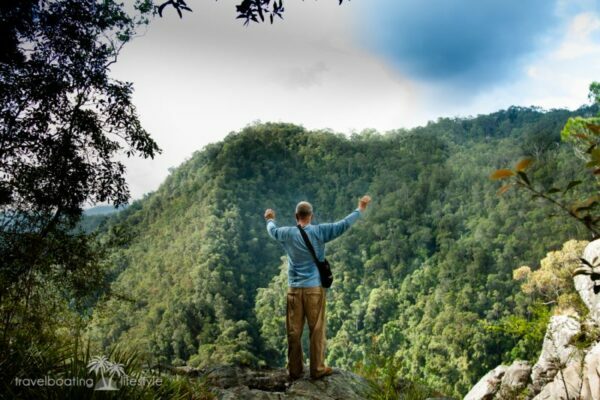 Have you hiked any of the Atherton Tablelands trails? Tell us about your favourite walks in the comments below!